Today the Liberal Democrat’s manifesto comes under scrutiny, but first I have to ask a very important question...why is it SO long?! This manifesto is twice as long as the two main parties...very odd for the junior party in the Coalition, who are very unlikely to win a majority (odds even have them behind UKIP). Liberal Democrats – Did you know we’re in government...please don’t vote for the Greens! The other thing to take is their trademark jingle of we’ll “borrow less than Labour and cut less than the Tories” – a pledge that features regularly throughout the manifesto and which grounds all their economic policies. However they’ve simply not done enough to restore their credibility in the eyes of the voters. Although their manifesto is better costed than the Tories, it is not fully costed like their 2010 manifesto or Labour’s – an interesting prospect considering Labour’s apparent lack of economic credibility. 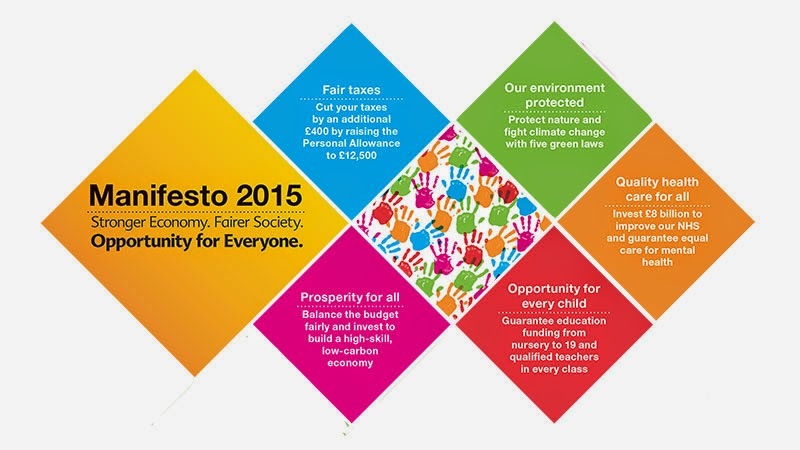 As well as this, their manifesto is full of wishy-washy promises, making it rather dull read – well more dull than a 160 page political manifesto usually is. They’ve made a point of placing their main policies on the front page, probably with the foresight that no one will be bothered to read there overly long magnus opus. They focus on: balancing the budget, increasing the personal allowance, £8 billion more for the NHS, equal care for mental and physical health and five new green laws - a helpful guide for their ‘red line’ policies in future negotiations. The issue of airport expansion could become the next tuition fees debacle if this document is anything to go by. They assure the public they remain opposed to expanding any London airport, yet promise to carefully consider the report into such expansion when published. They promise an airport infrastructure for modern Britain, but will not allow a net increase in runways. A poorly thought out policy, that contradicts itself too - is this what Lib Dem’s will be like if they're in government again? One of their more wishy-washy policies is the long standing Lib Dem pledge to move towards a federal UK. Significantly more powers for Wales, Scotland and Northern Ireland, while also promising an English veto for English only legislation - another attack on Labour’s stance on English votes for English laws. One policy they would most likely drop should a coalition with Labour be on the horizon. A strengthening of local government is also on the cards, in-line with Conservative and Labour pledges, however they are the only party to promise a change of voting system in local elections to Single Transferable Vote (STV) - like Scottish local elections. This pledge is completely necessary to end unaccountable councils with little or no meaningful opposition (Manchester council currently has 96 Labour councillors and one independent). The Lib Dems focus on green issues, although important, feels like an attempt to draw voters back to the party who are thinking of voting for the Greens. Highlights include: new Carbon targets, reducing council tax on energy efficient homes, a new 70% recycling target and to plant a tree for every child born (how lovely!). These policies are unlikely to bring voters back, with many abandoning the party due to them joining a Conservative government – attracted by the Greens pledge to lock the Tories out of Number 10. The effect these green and rural policies will have is strengthening their core vote in key marginal seats. Their promises on improving flood defences will prick the ears of votes in rural Somerset, badly impacted by flooding in 2013, pledges on keeping local post offices, libraries and GPs open and improving broadband speeds will also help bolster their position in these constituencies – although it’s probably too late for them in Scotland now. With their dismal polling in recent months, the Lib Dem's hopes rest on their strong local campaign - this manifesto is just “too safe” to attract floating voters. Although it does present the party as a ‘safe pair of hands’ they lack the knock-out policies of the Tories and Labour. For a party at risk of losing half its MPs it is simply too little, too late.